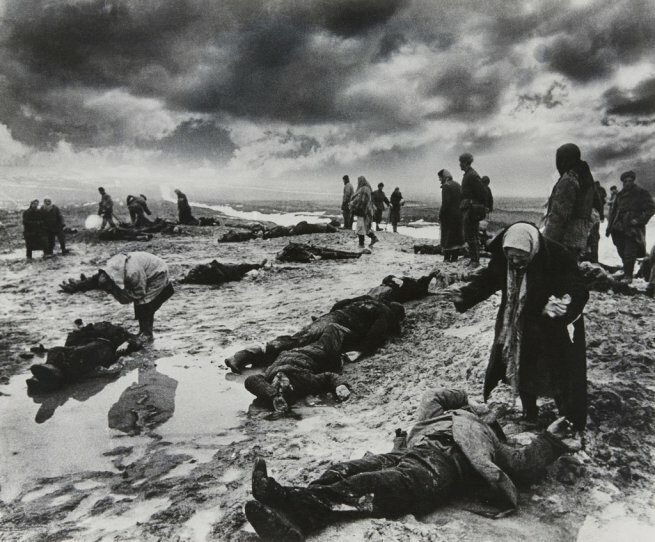 Don McCullin photographs scenes of despair, he has worked in areas affected by war as well as areas affected by poverty. James Nachtwey, another war photographer captures images of battle but chooses to show the impact that war has on the families involved rather than the soldiers. Martin Parr, a social documentary photographer takes photos that express the often ludicrous trends that we follow in modern culture. 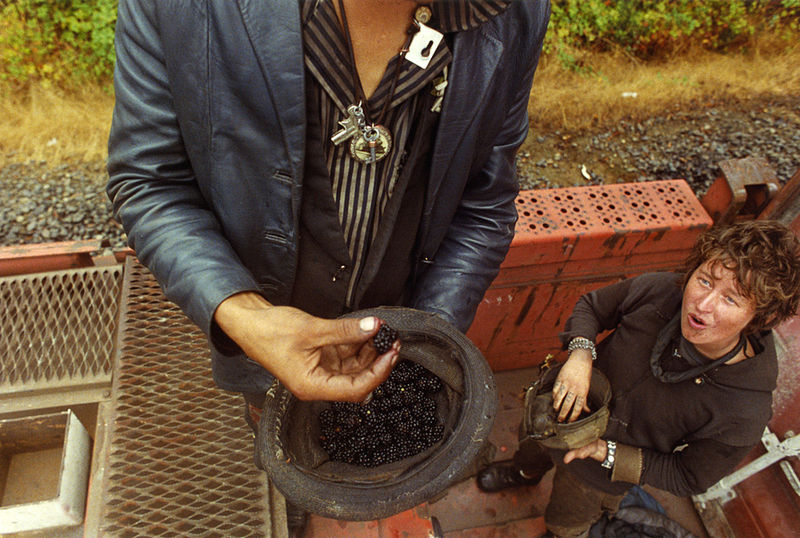 Mike Brodie is known for his series on Train Hoppers, images are shown above. He captures scenes of day to day life for people living in extreme conditions. 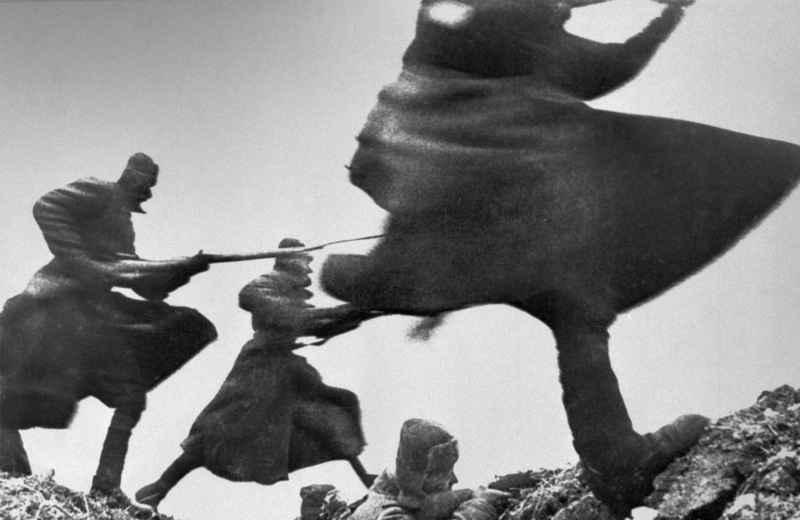 Dmitri Baltermants photographs scenes of battle and the aftermath. In his images he expresses the emotions felt by those effected by war. Corey Arnold looks into the daily lives of people from different walks of life, with different backgrounds and occupations. He is best known for his series in which he follows a group of fishermen, photographing them as they do their job on trawler ships. Dorothea Lange is known for her series that documents a family's struggle during the period of the great depression in America. She capturees images of sorrow in different extreme conditions and settings. Arthur Fellig is a photojournalist turned crime photographer. He captures images of crime scenes, moments after they are reported to the emergency services. 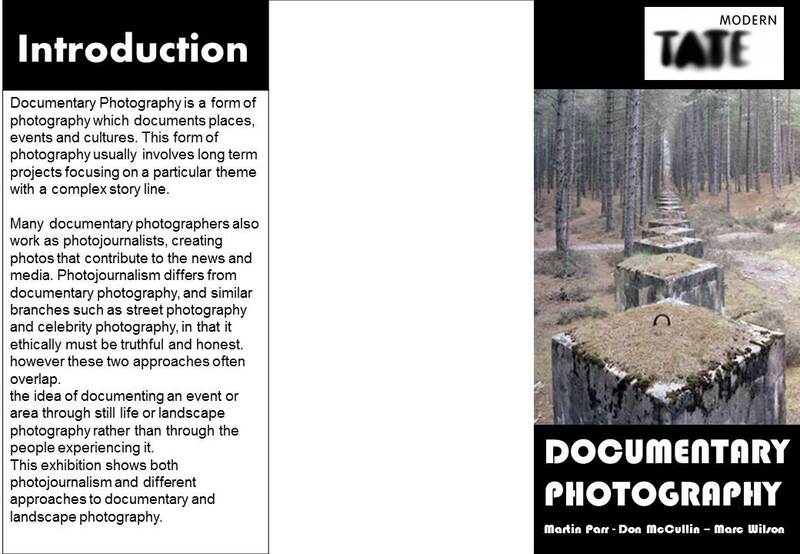 Documentary Photography is a form of photography which documents places, events and cultures. This form of photography usually involves long term projects focusing on a particular theme with a complex story line. Many documentary photographers also work as photojournalists, creating photos that contribute to the news and media. Photojournalism differs from documentary photography, and similar branches such as street photography and celebrity photography, in that it ethically must be truthful and honest. however these two approaches often overlap. Martin Parr is a British photographer that specialises in photojournalism and social documentary photography. He captures scenes which give a deeper look into different aspects of modern life in England. He takes his photos in a way that captures the preposterousness of our daily lives, many of his images capture people when they aren't expecting it, causing them to be entirely natural and often humorous. In this image Martin Parr has captured a scene in which a large group of pale young children wait to be served at an ice cream stall, supposedly near the beach in Brighton. He has captured a moment where the woman taking orders is looking into the camera and several younger boys are gawping at her from behind the till. Here, Parr has caught brief moment in which the woman looks away from her till (presuming the scene was not staged) which mirrors stereotypes of young boys, this makes the image seem unique and natural. Close ups often feature in Martin Parr's series, these images show how the smallest of details can tell the story of an area or culture. I like how sometimes small details can tell a story as well as an image of the actual event. Arthur Fellig, more widely known as Weegee was a photojournalist and street photographer. 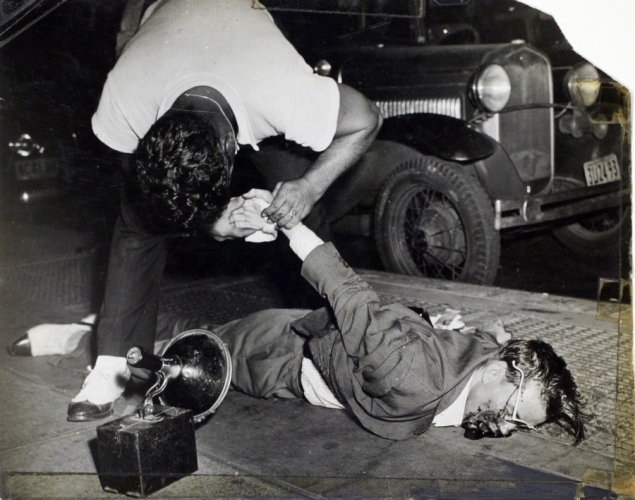 Weegee began his career in photography as a press photographer, following the emergency services and capturing crime scenes etc. His photos are a realistic representation of urban life, showing crime, injury and often death. This image shows a recently deceased man lying dead on the road, the man is concealed by a white sheet meaning that the emergency services have already done all they can. In the man's hand is a steering wheel, detached from the vehicle it came from which he is gripping tightly. There are no medics or policemen huddled around the man, the only sign of life in this image is traffic speeding by in the distance. Like all of Weegee's photos, this image is in stark black and white. 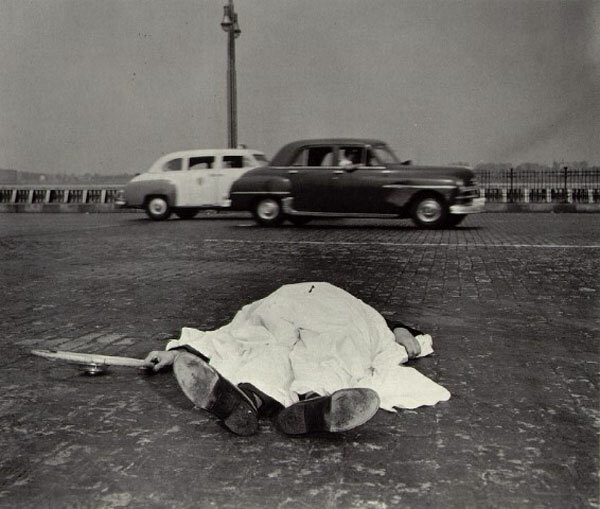 Weegee has captured the scene, moments after the man has been found dead, he has chosen to photograph this man alone with no crowds or members of the emergency services around or behind him. This makes the image more shocking as it is clear to see that this man is dead and there is nothing anybody can do to help. The two cars racing by behind the man, one of which appears to be some sort of ambulance, give us the impression that events like this happen everyday. Nobody seems to be paying this dead man attention and the people in their cars don't even stop to look. The steering wheel still gripped tightly in the dead mans hand gives the audience a haunting clue as to how and why he died. 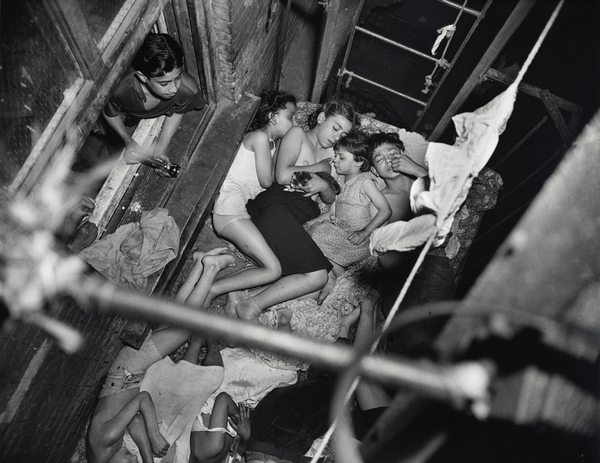 Weegee captures scenes like this to expose people to the grittier side of life. Similarly to Don McCullin, Weegee chooses to photograph the crimes that will shock people the most and will make the best story. 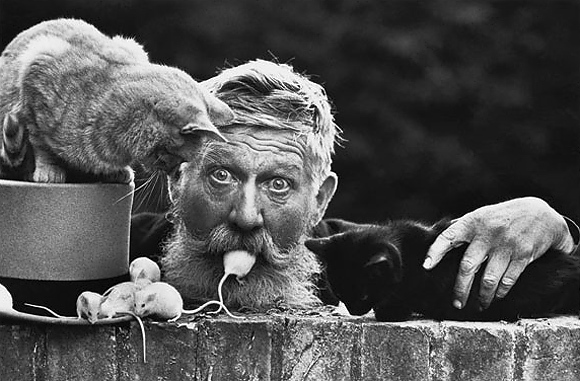 Don McCullin is a broadly known British documentary photographer and photojournalist. Unlike Martin Parr, McCullin captures darker, tragic scenes of war and poverty. He takes images that range from intimate portraits of unemployed, impoverished characters to busy scenes of battle. McCullin simply captures sights that touch him as he visits different extreme environments and events, "Photography for me is not looking, it's feeling. If you can't feel what you're looking at, then you're never going to get others to feel anything when they look at your pictures" - Don McCullin. He simply wants to expose people to the terrors of the underside of society, perhaps to provoke change. 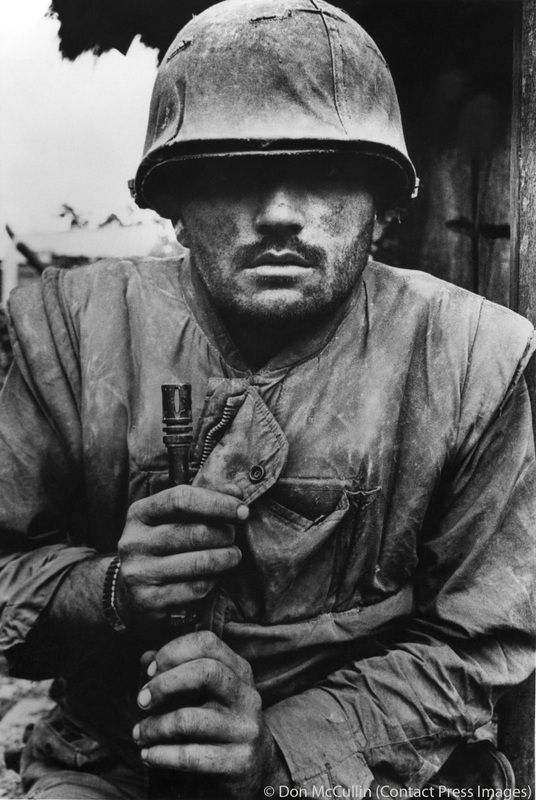 Below is a slideshow of some images from McCullin's 'Shaped By War' series, I have selected the images which I found most thought provoking. This image shows a man protesting against the Cuban Missile Crisis. He sits in the center of the image alone, there are no fellow protesters in the image and he is surrounded by a large group of uniformed police officers. we can only see the back of the protester's sign and the reactions to it on the policemen's faces. 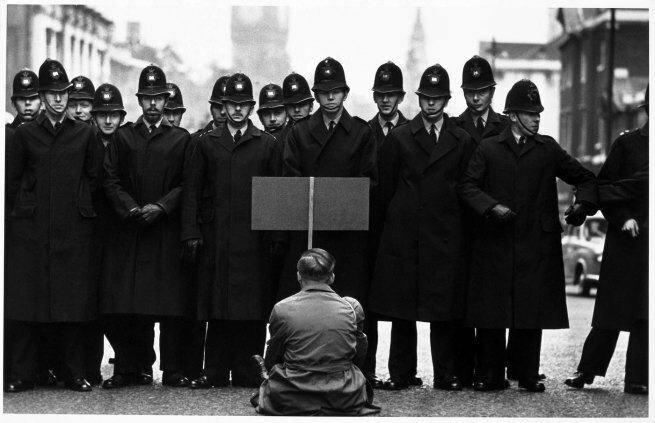 McCullin has captured this photo of a lone protester, although there was most likely other people protesting for the same cause nearby, this creates the impression that this man is vulnerable as he is outnumbered by the large squad of officers. The protester is seated, which emphasises his defenselessness against the solid formation of police. the fact that his sign doesn't even reach above shoulder height of the police means that nobody would be able to read it, giving the audience the impression that this man's opinion is not being heard. McCullin has taken this photo from a low angle, similar to the protester's height, this blocks out a majority of the background, making the group of policemen look more threatening. In this image there is a man dressed in black walking along the pavement with his back to the camera. Next to the man is an old wooden fence which is collapsed onto an empty, frosty patch of neglected land. Far in the distance among the fog are several factories, each with huge chimneys with thick black smoke billowing out. The man appears to be walking towards these factories, his collar is turned up to shield the wind and cold (which is evident as there is frost on the ground and the chimney smoke stretches across the width of the image), his hands are in his pockets and his head is low which gives us the impression he is unhappy. 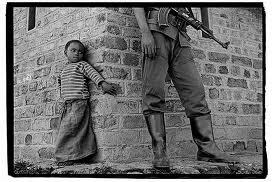 Like most of Don McCullins photos, this image is in black and white. He has taken this image with the character facing away from the camera, which hides the mans face. This not only makes him mysterious but encourages the audience to focus on what else is going on in the image. The man is almost a silhouette, which means the only information we can gather about him will be from his surroundings. McCullin has chosen a setting that is derivative of poor areas suffering from poverty; there are large patches of unused and run down land, high levels of pollution and signs of vandalism. He has also used pathetic fallacy by using the harsh winter conditions to emphasise the mood of the photo. McCullin has taken this image of a man on his way to work through wind, cold and deserted land to express the poor quality of life that some individuals deal with on a day to day basis. This image depicts a young woman walking a pram on an unpaved dirt path. The path winds into the distance, where there is a large factory with three tall smoking chimneys in the background. Beside the path is a selection of tattered machinery on what looks like a patch of disused land. The ground looks damp and the sky is grey and cloudy. The woman's hair is being blown by the wind and her face looks distressed. The image is black and white, it has a similar composition to the photo above, with a character in the foreground and a building in the background. The woman is slightly to the right hand side of the image, with the path in the center which leads to the factory. This has been done to draw the audiences attention to the scene in the distance. 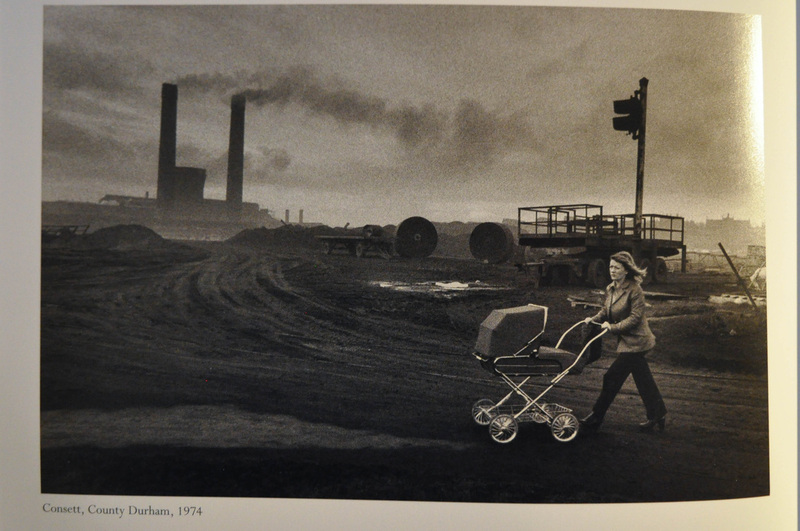 The dirt and smoke of the setting contrasts against the woman's neat appearance, making the viewer question this woman's story and why she is in such a derelict area walking a pram. In this image Don McCullin brings attention to the evident poverty and disuse of the area by placing an unlikely character in the foreground of this setting. In his later life Don McCullin became interested in landscape photography and still life works, he often captures scenes that would not usually strike us as beautiful or picturesque, but when seen through a photograph with the right conditions can be stunning. I'm not sure whether it is in comparison to his earlier work, or just the skill he uses to capture his photographs, but his landscape photography always seems to be highly emotive and calming, whatever he uses as his subject matter. I like the idea of documenting an event or area through still life or landscape photography rather than through the people experiencing it. I like how sometimes small details can tell a story as well as an image of the actual event. 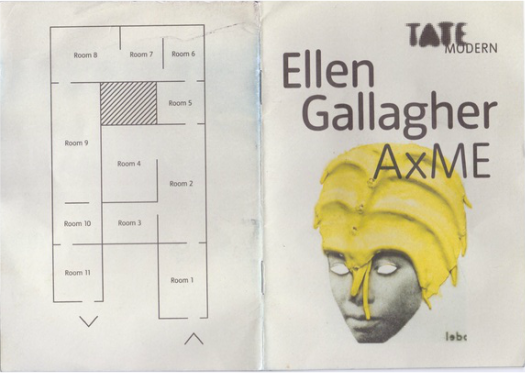 Tate modern is the most visited modern art gallery in the world. It holds a range of different art from the 1500s to the present day. This gallery is not only extremely large but would be easily adaptable and adjustable to the exhibitions needs due to its many wide open spaces. 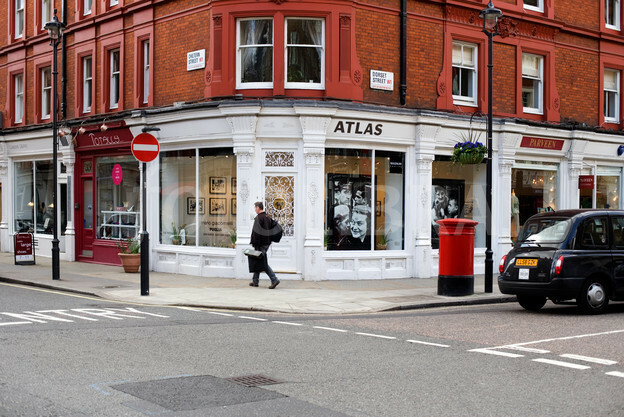 This gallery hosts a regular programme of 20th and 21st century photography. It has been known to show various works of photojournalism, contemporary and fashion photography. It is a single floor gallery with good lighting conditions, as it is not widely known it will attract only the most knowledgable, dedicated gallery visitors and possibly some aspiring photographers. The National Portrait Gallery (NPG) is a notorious art gallery in London, in 1896 it was moved to become part of the National Gallery, nearby Trafalgar Square. The NPG consists of several large, well lit rooms linked together. Although this is not a regular site for exhibitions, it would provide a marvelous visual promenade with more than enough room for the average exhibition. The pier would also relate to photographers that capture street life and British culture, especially Martin Parr's Series: 'The Last Resort' and 'Think of England'. Using this site would link to and emphasise the themes present in my exhibition, creating interesting juxtapositions. - Features an introduction from the director of the museum/gallery. 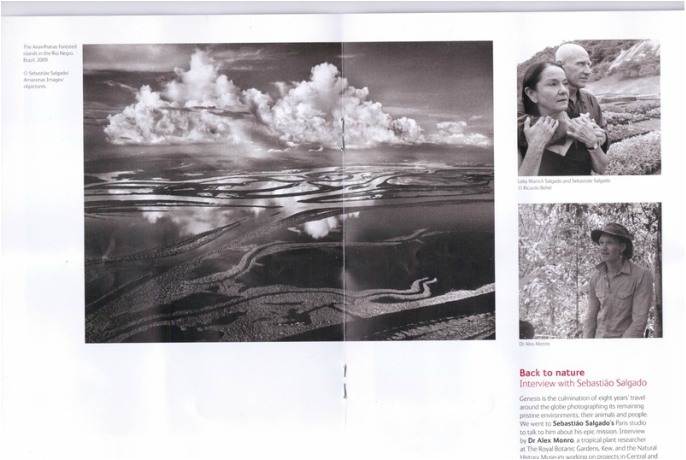 This helps explain the exhibition to those who haven't seen Salgado's work before. - In the introduction the director explains why they decided to hold the exhibition. 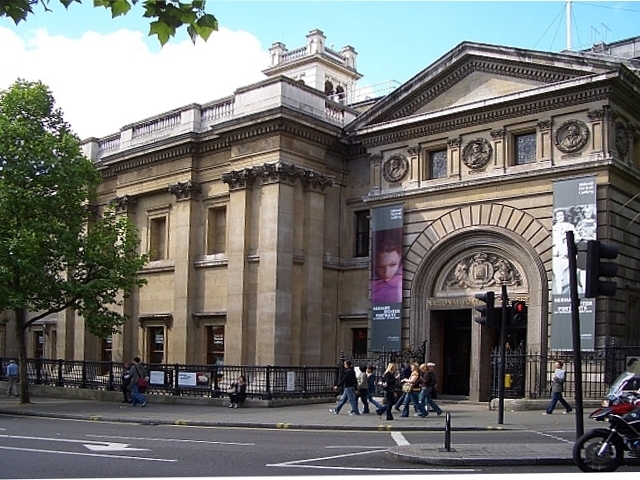 In this case the Natural History Museum is holding a photography exhibition because it features detailed images of various habitats and species. - Has an interview with the artist about his new body of work, giving the visitor an understanding of the artist's intentions, background and the history of the work. - Images of some of the work as well as images of the photographer himself. This makes the visitor feel as if they know the photographer, helping them connect with the work and perhaps improving their understanding. Anonymous photographs tend to have less impact on their audience. 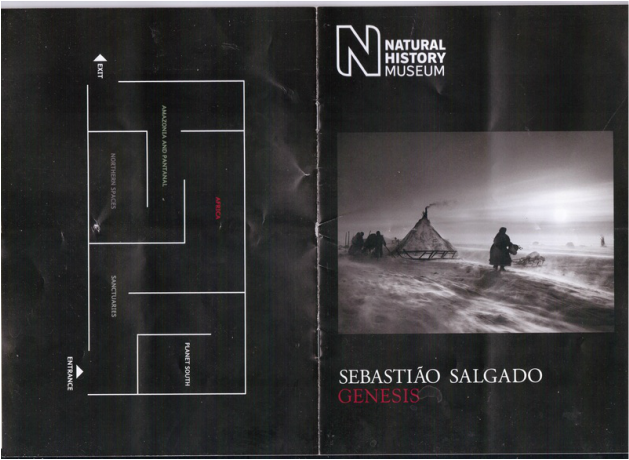 - The front of the leaflet is simply designed with an image of one of Salgado's pieces above the artist's name and the title of the body of work. 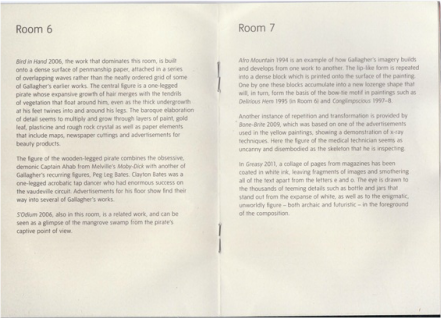 - The back of the leaflet has a map of the exhibition and a brief explanation of how the work has been categorised and set out. There is nothing worse than visiting an exhibition and getting lost, or even missing some of the work. I have included this leaflet even though this is not purely a photography exhibition, although it does include some photos and photo-collage, because this booklet is help the visitors understanding of the work rather than to advertise the exhibition. - Has an introduction to the artist, talking about her background, subject matter, her development and how she came to fame. - Features a room by room explanation of key pieces and themes. The text in these explanations is dense and helps the visitor to grasp a full understanding of the work and the reasons and deeper meanings behind it. Most of these explanations are written by the curator with quotes from the artist herself. 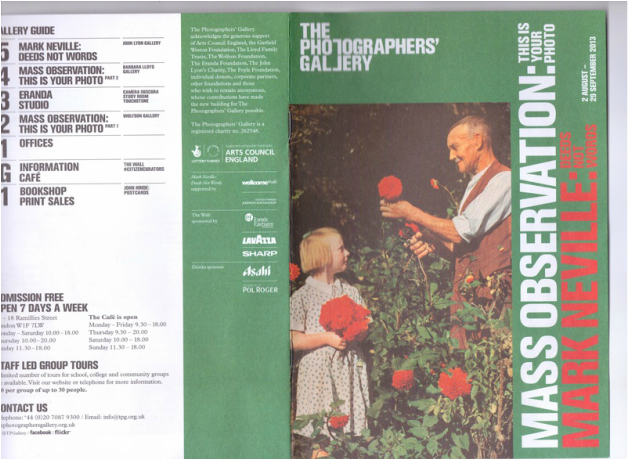 - This is an example of a more scholarly leaflet, instead of aiming to grasp the attention of the visitor this leaflet aims to supply full information to accompany the viewer around the exhibition. - There is a simple design on the front and a floor plan on the reverse. the text goes chronologically from room to room. This exhibition focusses on the faded glory of several derelict and abandoned structures across the world. When buildings and areas are abandoned, items and belongings are left behind, especially in war zones or areas in danger. Such photographs feature in Nadav Kander's 'Half Life - Chernobyl' series and Marc Wilson's 'The Last Stand' series. Many photographers record remains of the building's former self as well as the remains of the people who owned and used them, giving us an insight into the building's history. This exhibition looks into a series of photographs that evoke a sense of stillness and purity through abandonment, looking at the effect that images of previously populated, empty expanses have on their audience. The three photographers featured in this exhibition are Nadav Kander, Marc Wilson and Mathew Merrett, particularly their landscape work. Nadav Kander is known worldwide for vibrant images that capture deserted areas affected by extreme conditions. Marc Wilson's focuses on the theme of emptiness. He conveys this idea in his photos by capturing large open expanses, which helps to highlight the sense of desertion and abandonment in the area. He also uses objects and small details in his photography to tell the story of an area or event, such as World War Two in his documentary series 'The Last Stand'. Mathew Merrett photographs dilapidated architecture, particularly the interiors. Similarly to Nadav Kander his images are often colourful but with a gloomy setting. The exhibition explores how landscape photographers and artists respond to the theme of abandonment and how they document the rise and fall of various public and private structures. I will look into the methods that these photographers use to capture the story behind their subject matter and the different styles they incorporate into these images. This room presents scenes with clear signs of life and areas that look as if they have been left in a hurry. Nadav Kander chose the nuclear disaster struck buildings of Chernobyl as his subject matter. The sites he photographs have one thing in common; evidence of almost instant desertion, for example classrooms with chairs still left in their places and equipment on the tables. This gives his images an eerie feel because they are everyday scenes devoid of life and activity. 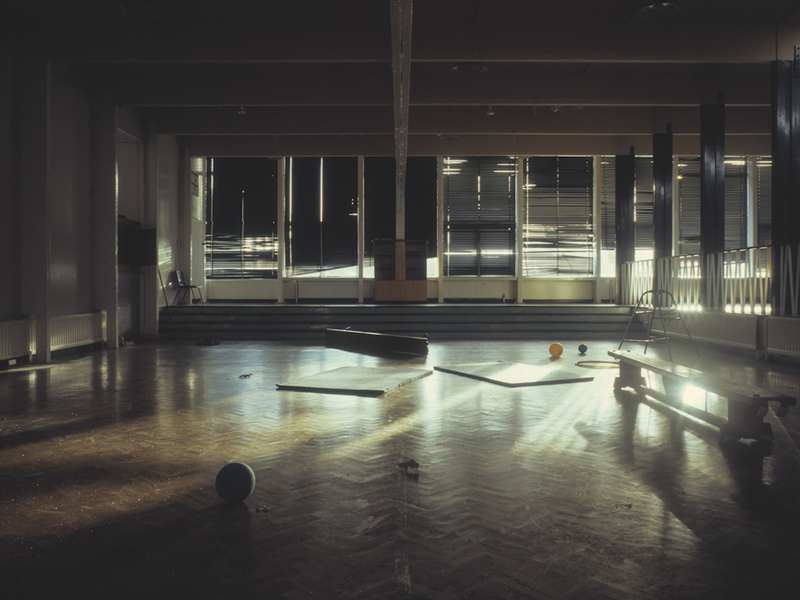 Kander uses this idea to his advantage in many of his shots, for example by capturing classrooms and nurseries, which would normally be bustling with movement, creating a dramatic contrast to their current state of silence and stillness. Nadav Kander is a London based photographer, known for both portraiture and landscape photographs. 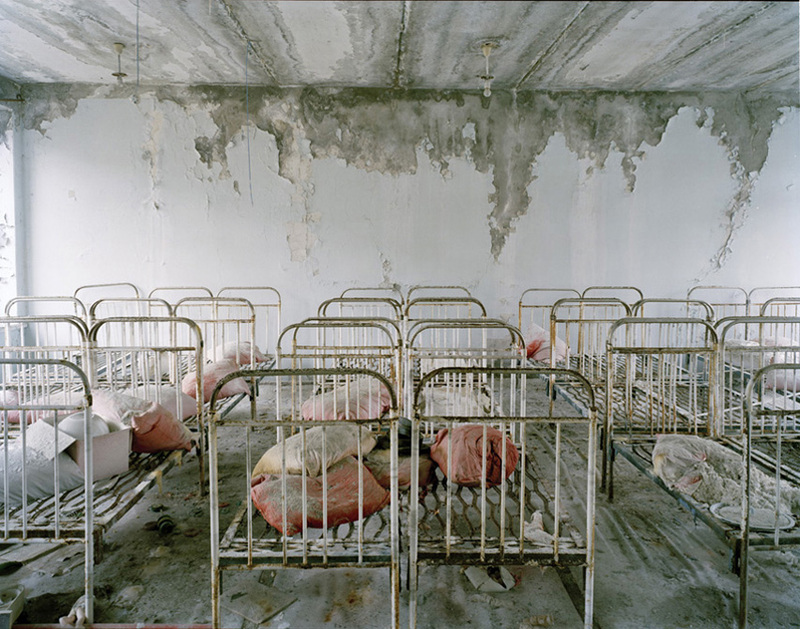 His Chernobyl series features a group of images that look into deserted and abandoned buildings and areas. His photos are usually bright with a range of vibrant colours. Kander published his first monograph, Beauty’s Nothing in 2001. In 2008 he was awarded the Silver Photographer of the Year at the Lianzhou International Photo Festival in China. He was named International Photographer of the Year at the 7th Annual Lucie Awards in 2009 and also received awards from Art Director’s Club and IPA in the USA, from the D&AD and the John Kobal Foundation in the UK and Epica in Europe. He won the IPA Awards for his photography. 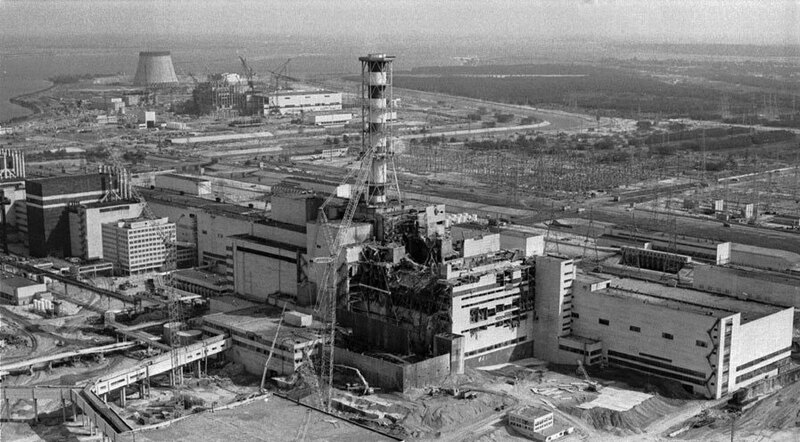 The Chernobyl disaster, that occurred on 26th April 1986, is considered to have been the worst nuclear power plant accident in history. An explosion followed by a fire released large quantities of radioactive particles into the atmosphere. The event killed almost 4000 people, as well as causing an increase in risk of cancer for countless others across the most contaminated areas of Belarus, Russia and Ukraine. From 1986 to 2000, 350,400 people evacuated from the most severely contaminated areas. Chernobyl Power Plant, the epicentre of the nuclear explosion. 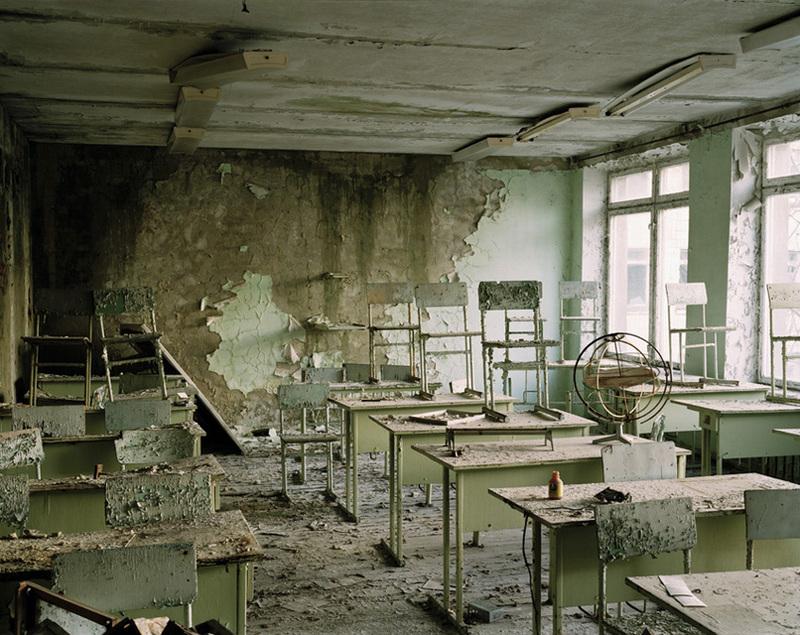 This image is of an abandoned classroom in a derelict school in Pripyat, Chernobyl. The wallpaper is peeling off, the light fixtures are dropping from the ceiling and the tables and chairs are rotting. Although this school is clearly derelict and no longer in use, the tables are still in place with chairs neatly stacked on top of them. Kander has taken this image from the perspective of where we would expect a teacher to be. The angle used emphasises the order and organisation of the classroom; the desks are neatly in line however this is contrasted with the disarray of the wreckage caused by the disaster. Kander has desaturated the image and any vibrant colours have been removed giving an impression that there is no warmth or life left. This image displays a sleeping area in an abandoned kindegarten, rows of metal bedsteads fill the room. The beds are rusted and discoloured, rubbish bags and stained pillows sit on each bed. The paint on the walls is peeling away at the top and loose wires are hanging from the stained ceiling. The beds are in pairs which hints at the cosyness of the room when it was in use, now it is as if the rusting bedsteads are clinging onto each other for support. The soft pillows allude to the bodies of the children in the kindergarten having their afternoon nap, bringing up a haunting reminder of the room's previous use and what happened there. These pillows are the only colour in the image which draws the viewers attention to this theme. Kander has taken the image in close range of the rows of bedspreads, at a flat on angle which gives the image an almost aggressive, confrontational feel. There is no soft focus in the image, which exaggerates the harsh structure of the composition. 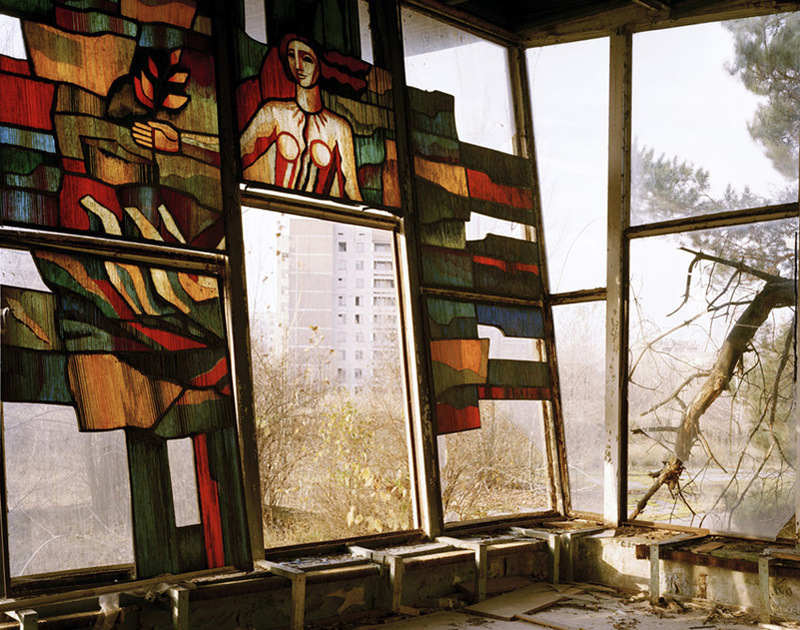 This image shows a large frame of stained glass windows in an abandoned cafeteria in Chernobyl. The stained glass has a variety of bright tones, made more vibrant as the daylight passes through them. Many of the window pieces are broken and the surrounding window frames are empty, revealing a light background of a block of flats in the distance and trees that are growing outside the windows. The intense colours of the stained glass contrasts against the pale washed out colours it's surroundings. The stained glass makes reference to traditional tapestries and stained glass making, which also contrasts against the concrete and steel present in the background. The washed out colour of the background looks cold and wintery which sets the tone of sterile frost and desertion. Nadav Kander has used the warm colours of the glass as a comment on the scene behind and the state of the area he is visiting. He has taken the image from an angle which includes half stained glass and half exposed background, conveying the idea that something has been lost and has fallen away. He has dulled down the vibrancy of the scene behing in order to bring up comparisons and contrasts against the stained glass window, which is a reminder of the rooms former glory. Decay is the theme for the second room, this theme looks into the effect on objects and building over long periods of time. Mathew Merret's images work on the idea of decay bringing colour back into a building, his series 'Urban Decay' contains many examples of how something that has suffered from ageing, decay and vandalism can be beautiful. Many of his images find patterns in dilapidated interiors to highlight the once admired architectural structure of large empty expanses, such as the roofs of churches or the perspectival metalwork of a factory. Mathew Merrett is a photographer known for his work on the theme of decay. He has captured decay through photographing derelict factories, houses and churches looking into the wide rang of colours and fine details that develop through a building's decline. He means to capture derelicts as if they are growing museum pieces, frozen in time before the redevelopment cycle erases them forever. He wishes to bring light to details and sights that people wouldn't normally give a second glance to, essentially resurrecting the beauty of particular buildings that have been forgotten. 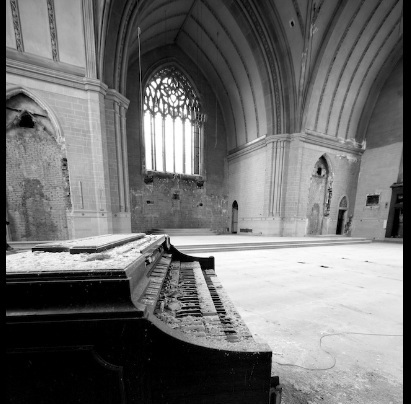 Merrett began working on the idea of Urban Decay, capturing images of derelict and forgotten buildings. Mathew Merrett formed a group of photographers that work on similar themes, named the DK Group. His first exhibition was at The Steam Whistle Gallery in 2006, it showed his series 'The Art of Decay'. He had his first solo exhibition in 2007 at the Pentimento Galley, displaying his 'Urban Decay' series. In 2009 he went to the Ukraine to photograph the aftermath of Chernobyl. He visited the exclusion zone to capture the abandoned city of Pripyat to piece together his 'Still Mine' series. Merrett's 'Urban Decay' series featured in the Toronto Outdoor Art Exhibition. 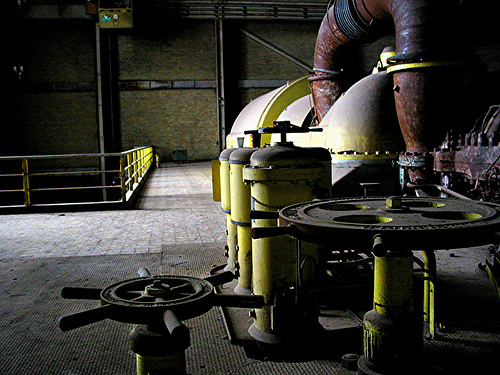 This image captures a view through the interior of a disused factory. This long stretching section of the factory has been stripped of it's walls and roof, all that remains is the structural supports and some sections of scaffolding. Layers of paint have gradually flaked off, revealing a range of reds greens and blues from different coats of paint. Sheets of metal and large piping cut across the image at regular intervals. 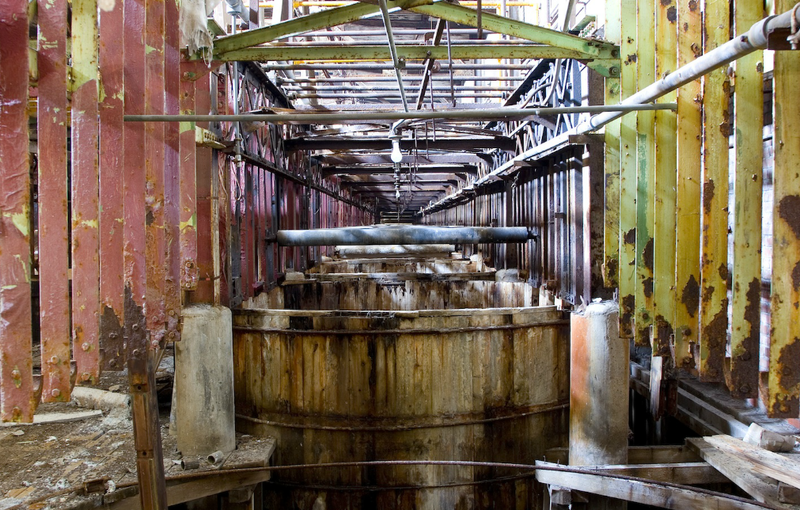 The pipes, metal sheets and bottoms of the structural supports are heavily stained and rusting, revealing strong brown and red metal underneath. This image is a clear representation of Mathew Merrett's theme of urban decay. The numerous stains and rusting metal highlight the disuse of the building while the exposed range of different coats of paint give a slight insight to the building's history. Merrett has used a once sturdy structure as his subject matter to contrast against it's current state of abandonment and weakness. Almost everything in this image is metal, emphasising the rust of this factory and the manner in which it has been left to decay. Merrett has used the structure of the building to frame the view of the interior. He has taken the image from an angle that creates a symmetry, a sense of order but order within decay, a little like the school desks in the Kander image from Room 1. The poles disappearing into the horizon suggest that the rusting walls continue far into the distance, out of sight. 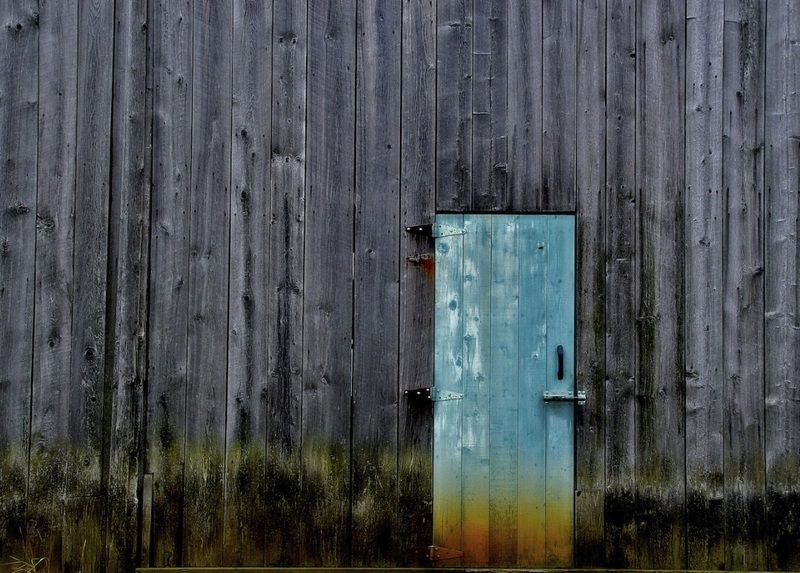 The image to the right is of the exterior wall of a derelict barn, the door of the barn lays centre right on the wooden wall, it is a bright cyan colour which stands out against the washed out silver grey of the surrounding wall. The bottom of the wall is stained and discoloured with a mouldy green, the bottom of the cyan coloured door is yellowed. The plain, weathered grey of the wood brings out the colours of decay, creeping up the base of the wall. Merrett has quite literally highlighted his idea, that decay can contribute to the composition of an image. The washed out grey of the wood contrasts against the vibrant colours of the creeping decay and the bright painted door. He has presented the decay in this photo positively; showing it to improve the appearance of what was already there, rather than taking away from the building's glory, which is the conventional idea behind the photography of dereliction. 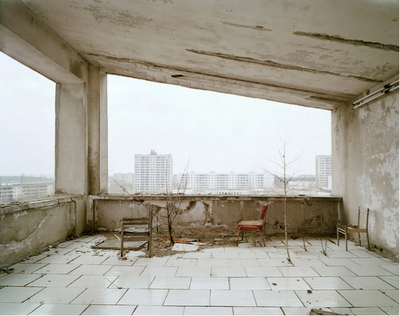 In addition to the theme the theme of decay Mathew Merrett also explored similar themes to Nadav Kander, with similar subject matter of Pripyat, Chernobyl. 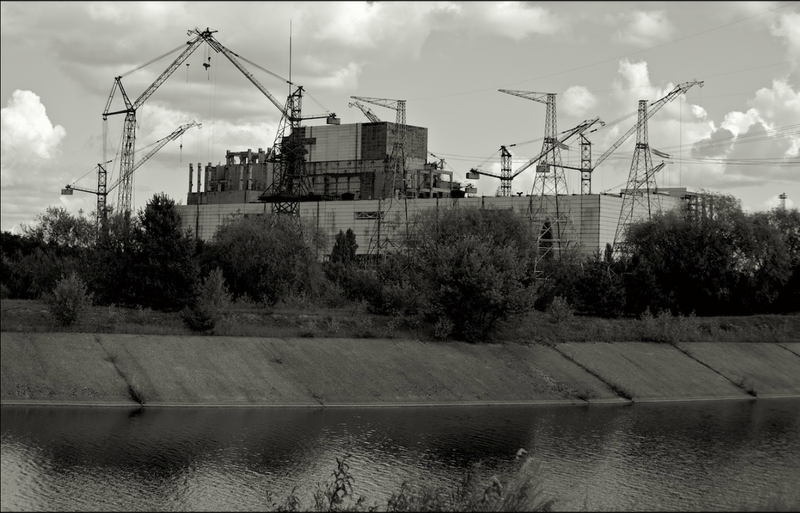 Below is Merret's Chernobyl series, this has been included as it is a clear comparison to Kander's 'Half Life' series, showing how these two artists approach the same subject matter and themes with different photographic styles and techniques. This image presents a large factory under construction surrounded by cranes and container carriers, in the foreground is a shallow canal. Thick clouds fill the background of the image alongside a few trees and bushes. The image has been printed in black and white. The lack of any colour in this image not only clarifies some of the detail and contrast of tones, but also emphasises the state of disuse and abandonment that the half finished construction site has been left in. The image highlights the lack of activity and movement in the construction site, revealing the state of abandonment following the nuclear explosion in Chernobyl. Merrett has emphasised the emptiness and desertion of the nuclear explosion struck city of Chernobyl by removing all colour from almost all of the images in this series. The few images that are in colour relate to a similar theme that is expressed in his 'Urban Decay' series. Mathew Merret has also visited other dramatically effected abandoned areas such as Detroit,USA, where he captured images of the abundant range of abandoned buildings with no further purpose in what is rapidly becoming a ghost town. Detroit, once America's most industrious city reflects abandonment in a unique way. The plummeting industry was joined with racial, political and social tensions, resulting in a dramatic de-densification of the city's population. 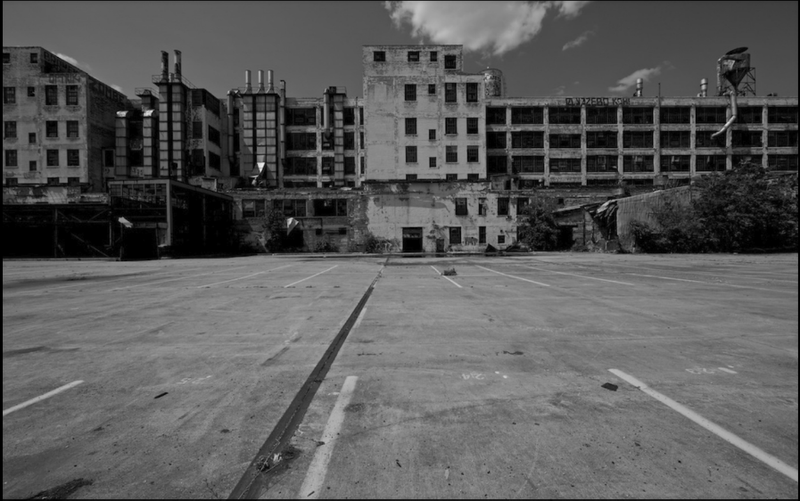 Factories closed doors, jobs disappeared and today Detroit's population has decreased by over 50% since 1950. The upper and middle classes of the area soon fled the area after the sudden decrease in employment, resulting in a huge lower class population with no means to maintain a city which is now twice the size it needs to be. This image shows an empty car park. Across the expanse of deserted space we see one of Detroit's many derelict car factories. There is no sign of life; not even a car remains to suggest the building's prior function. The image is in black and white intensifying the shadows and highlighting the composition. The media also emphasises the emptiness and desertion of the area. The fact that such a large car park, which would normally be bustling with activity, is deserted emphasizes the redundancy of the entire site. The one element of hope in the blue sky becomes hopeless devoid of any colour. The windows have no detail of what is behind them, just a deep black, giving the building a hollow and vacant feel as if these windows are the building's blind eyes. Merrett composed the image with the lower half empty of any content, almost blank. This scene, that has no sign of movement evokes the impression that it has been frozen in time, giving it an intensely still atmosphere. This room focuses on the theme of artefacts, small or large, which can be found in abandoned areas and show signs of how they have been altered over time. 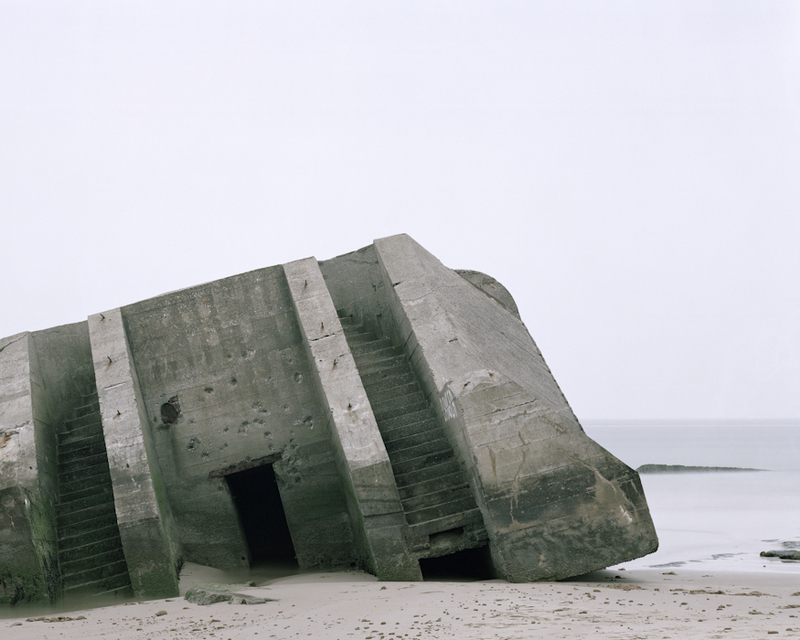 For example, Second World War military defences are the subject matter for Marc Wilson's 'Last Stand' series . These monumental, monolithic structures show signs of their history, whether it be via bullet holes from battle or gradual erosion from the years of abandonment. Marc Wilson is a landscape documentary photographer who captures scenes of abandonment and emptiness. His photos often include structures or objects that show the history of an area and the people that used it. For example his 'The Last Stand' series features images of defensive military structures that display the history of the second world war through small details. "This piece of work aims to reflect the histories and stories of military conflict and the memories held in the landscape itself". Wilson's focus on the artefacts of events and areas and the fine details within them is essentially his way of capturing the past and the present as one. 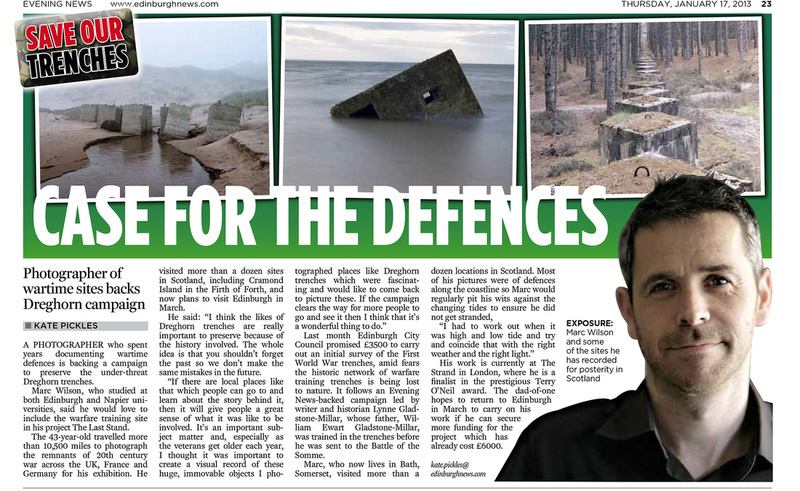 He also looks at unknown abandoned sites, which give the viewer a chance to unravel the derelict's past, using surroundings and the remains as clues, leading us to inspect how they have ended up in their current state of abandonment and distress. Marc Wilson was born in 1968 in London. Wilson began shooting commercially in 2002. In 2003 he began his work on his 'Abandonment' series, the project was completed in 2004. His work on abandonment featured in the 2006 PDN Photo Annual. He began working on his 'Last Stand' series. His series 'The Last Stand' was published in both Wayne Ford and Photomonitor. 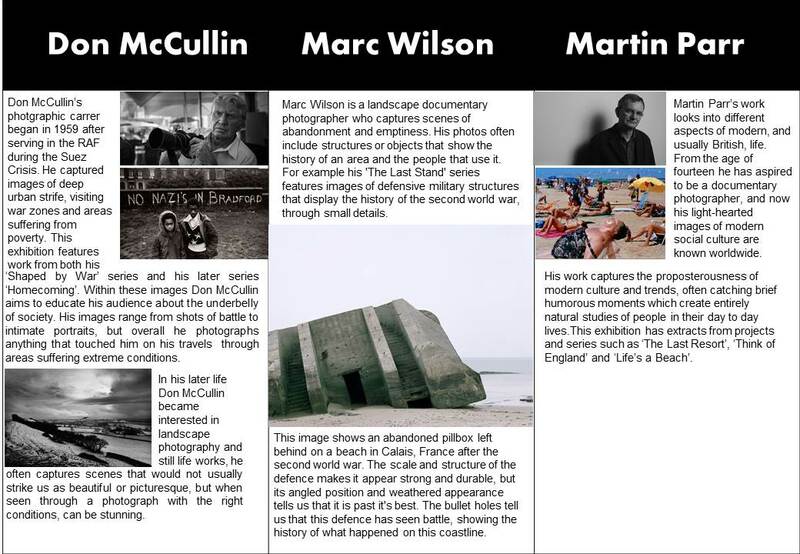 Marc Wilson won the Terry O'Neill Award. Marc Wilson's 'The Last Stand' Series documented areas affected by the Second World in England and France, capturing images of defences and structures that have been left behind. The structures are standing remnants of the battle that took place on these coastlines and fields, these photos tell stories of the conflict that they endured and how the landscape has shifted around them. The defence leans to one side as the land below has shifted over time, one side of it sticks up into the air. The structure is still intact, however there are cracks and gaps in the stonework. A thick cluster of bullet holes lies over the entrance to the pillbox, the edges of the walls are discoloured and weathered. The scale and structure of the defence makes it appear strong and durable, but its angled position and weathered appearance tells us that it is past it's best. The bullet holes tell us that this defence has seen battle, making the audience think of what happened on this coastline. The photographer has included some background in this image, giving the audience an idea of the photo's setting. Wilson is expressing how an inanimate object can tell a story of an event or area. For example the pillbox in this image has a history to it, with reasons for every dent, scrape and bullet hole, suggesting that this defence has been host to battle and is most likely the scene of a soldiers death. This image is of a large, disused outdoor swimming pool, the image is taken from the deep end of the pool with a view across the stretch of swimming pool floor. Tiles are broken, scattered and missing, there is litter and dead leaves around the edges of the pool. The sides of the pool are masked in graffiti. This photograph expresses how a place can change when abandoned, there is no life remaining in this area, only remains of its former vibrance. The stark white of the floor tiles matches the pale white sky, which helps to convey the silent emptiness of this disfigured site, while highlighting the purity of such an open, enigmatic area. 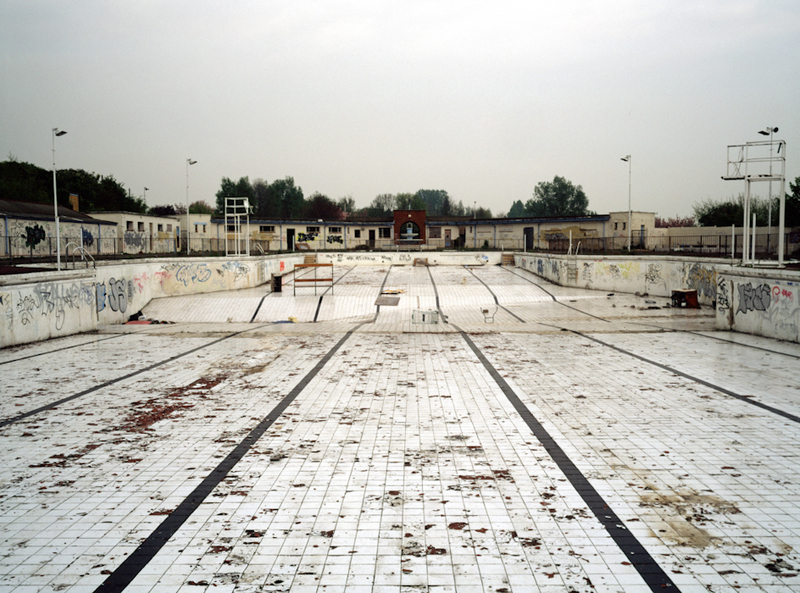 The lines of the swimming lanes stretching into the distance emphasise the huge expanse of the area while the surrounding structures hint at it's previous use. In his 'Abandoned' series, Marc Wilson captures the 'non-places' of England that have been forgotten over time and left in a state of disuse and often distress. This image expresses this idea; presenting a place that would normally be a buzz with activity, colour and movement, which contrasts against it's current state. This image is of a wide disused classroom lit by the gaps in the broken blinds on the far wall. Remains of the room's previous use are scattered around the room. The soft light from the windows bounces across the shiny parquet floor, and illuminates the remains of the room's inhabitants. Taking the image with the blinds down makes the room feel private and untouched, the room looks as if it has been left in the same state it was when it was last occupied. One of the only signs that this room is in fact abandoned and situated in a derelict building is that the blinds are damaged and have been unsuccessfully boarded up. Marc Wilson has taken this from the centre of the room, with the main ceiling beam cutting straight down the middle of the composition. The horizontal beams give the image a sense of perspective and direct the eye to the broken blinds and source of light, essentially framing the focus point. This image is almost entirely symmetrical, making it easy on the eyes, which reinforces the idea of the derelict being untouched and tranquil. For me the clearest three key themes common among these artists are decay, blankness of vacant areas and remains bearing witness to a derelict's history. All artists explore the idea of the surprising beauty of empty derelict buildings, portraying abandonment with an evocation of time passing and the history embedded in rooms and spaces. These three photographers differ in their subject matter, either choosing unknown abandoned sites, which bring up a sense of mystery and unease or well known areas that have been effected by specific events such as the decline of industrial city, Detroit and the nuclear disaster in Chernobyl. They also display their subject matter with different emotional effects, some convey an sense of untouched desertion and other images may strike the audience as aggressive, with signs of vandalism and disregard. I will employ and emphasize these common themes, ideas and emotional effects in my practical work in response to this field of interest. Looking into these artists has helped draw out different strands and motifs within this theme. This research has also given me a good insight into successful categories of subject matter and the techniques these artists use to emphasize different ideas, such as close details and black and white photography. I will also incorporate, explore and develop other techniques used by these artists, such as using the architecture of a building to give structure to the composition of an image or to frame important details.